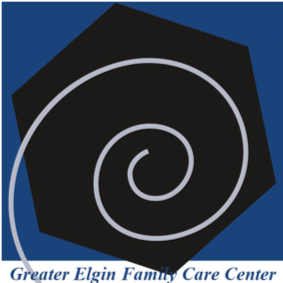 Springboard is looking forward to the opportunity to re-brand and re-introduce Greater Elgin Family Care Center to the marketplace. Below you will find a very brief case study for a healthcare organization we feel you will find relevant. While your branding efforts may or may not include all of the following, we wanted you to imagine the possibilities for your brand. Holy Cross Health is a Catholic, not-for-profit healthcare system known for quality and its commitment to the communities it serves. They expanded from a single hospital in Silver Spring, MD, into a system of hospitals and health services in locations throughout the community in order to increase access and enhance the patient experience. The new brand must depict the breadth of Holy Cross Health’s services to tell the story of a comprehensive health system offering innovative programs and services, when and where people need them most. 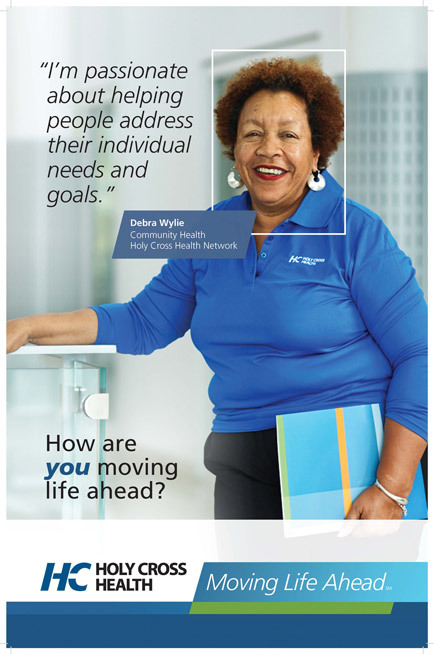 Holy Cross Health is a forward-thinking health system with the knowledge and resources to help people address their individual needs and goals to achieve a better quality of life. 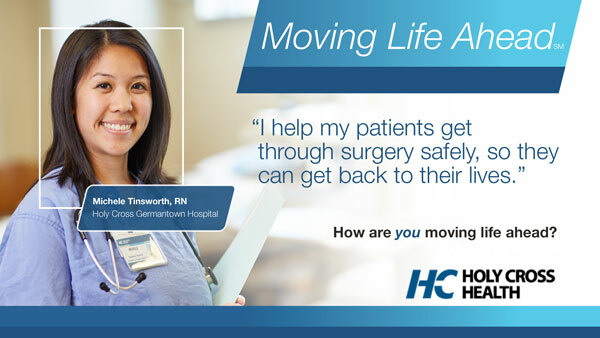 Holy Cross Health is here to help me move my life forward. The new theme and brand message was first launched to employees and internal stakeholders to educate and inspire them around the importance of the work they do each day. The new brand was introduced by the CEO online and through a number of town hall meetings. To engage employees around this theme, Springboard created a series of testimonials featuring employees explaining how they move life ahead. The brand theme was then launched to consumers. It promotes the breadth of the Holy Cross Health services to position them as better able to help people achieve more, through their continuum of care and innovative programs and services. 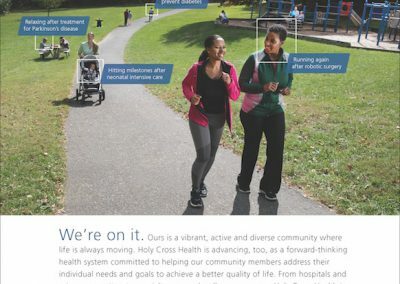 Ultimately enhancing the reputation of Holy Cross Health and building trust that they have the knowledge and resources to help consumers. 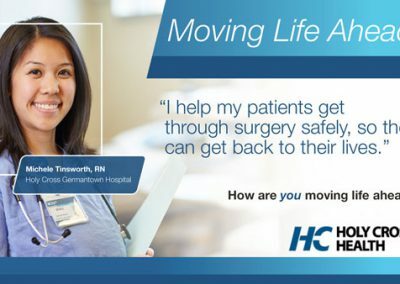 Springboard produced the following introductory brand video, it lives on Holy Cross Health’s home page and was served to the market through a series of digital and social media ads. 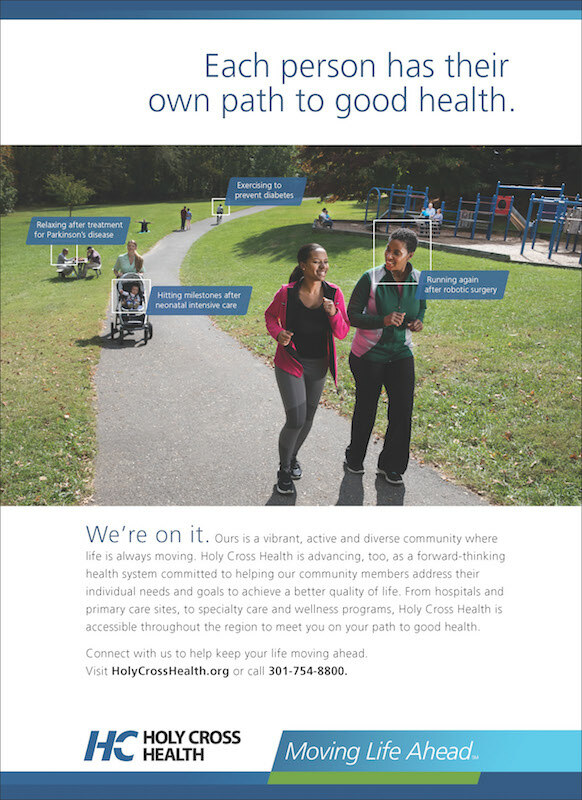 The following tactics were implemented to build overall brand awareness for Holy Cross Health. 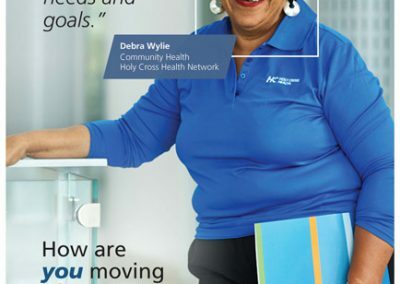 The following tactics were used to get the Moving Life Ahead message in front of people who are most likely interested in Holy Cross Health’s services and programs.